Join us on Facebook: Post comments, pictures, information. Spread the word. If you have your card punched at all locations on the crawl, you can turn the ticket in for a drawing! Lucky Star Brewery, Star City Brewery. for only $10. Once they are gone, that is it all folks. to the Burg to reconnect and share their memories and accomplishments. 2nd Annual Star City Pub Crawl in downtown Miamisburg! be received by June 8th. The committee is excited to share that the annual dinner/dance will be held at the Miamisburg Moose Lodge on Saturday June 15th. Doors open at 5:30 pm. Dinner starts at 6:00 pm. Please arrive early, because doors will be closed at 6:30 pm. The dance will be from 9 pm - 12 am (B-Caged is the band) $10 admission if not attending dinner - paid at door. We will be raffling off five baskets: Family Fun, Lottery, Party Time, Dinner & More, Golf (Golf winner announced at golf outing). There will be several buffet lines and dessert tables. The meat will be served. Volunteers will be available to help those in need to go through the buffet line. Coffee - Tea - Water will be at each table. Adult drinks may be purchased from the Moose. Vegetarian option: TBD When ordering tickets, please let us know this is your option. bargain for $1 per ticket or six for $5. Please Make sure all information is complete on the form. There will be assigned seating. Tables seat 8-10. 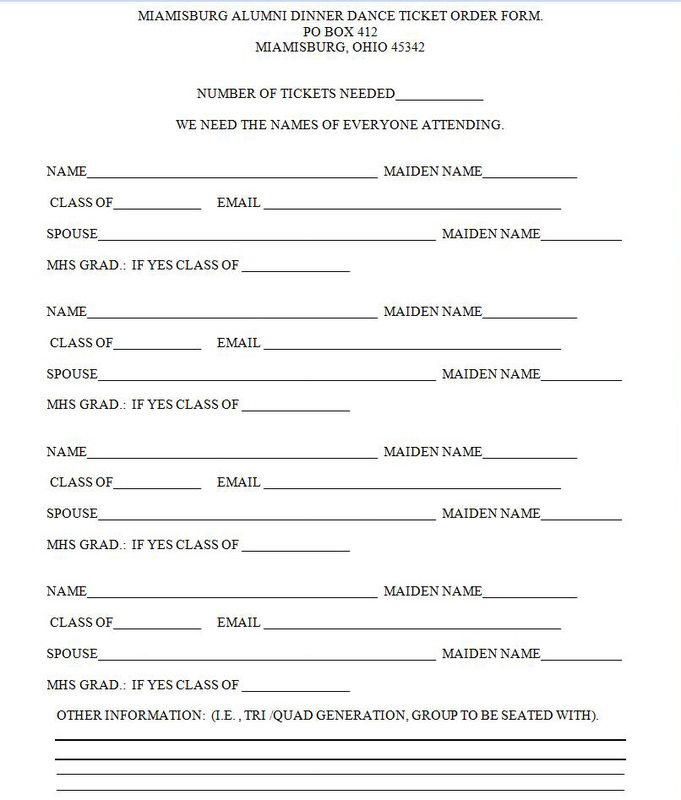 If family or friends are wanting to sit together and are sending in separate forms, please note a principal person as table head or list those people, so you can be seated together or purchase your tickets as a group. (This does not apply to the current graduating class, 25 or 50 year class). Please list all names in a Tri/Quad generation - including maiden names and graduation years. All members of Tri/Quad generations must be present at dinner meeting unless they are deceased. Outside Orders must be received by June 8th! Tickets will be at 'will call' and available for pick up at the Miamisburg Moose Lodge on the day of the dinner/dance from 5:30 - 6:30 pm. Ticket price includes the dinner and dance. 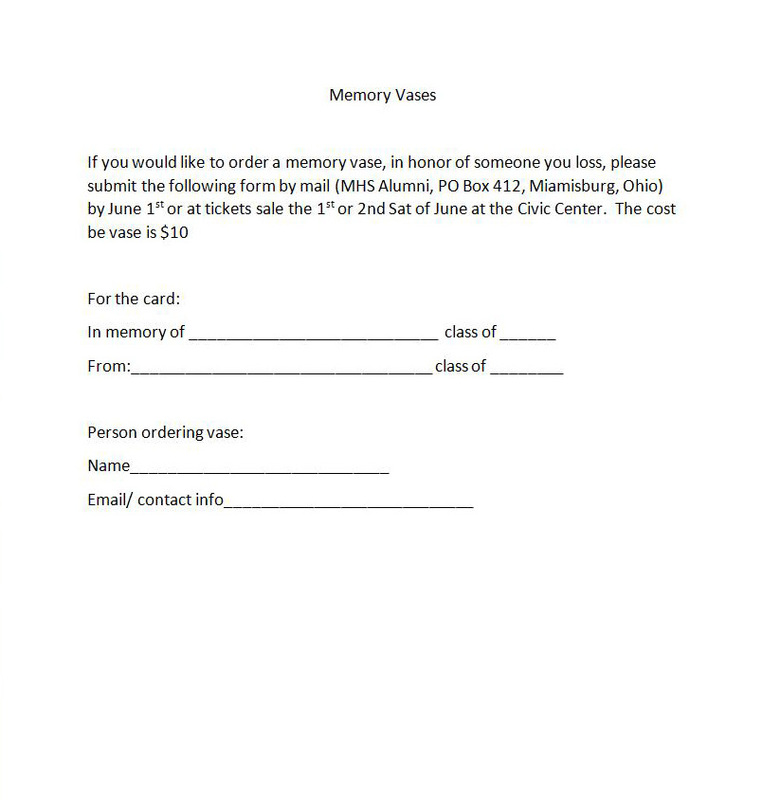 or mail form with check or money order ($25 per person) payable to: MHS Alumni Association P.O. Box 412, Miamisburg OH 45343.
or at tickets sale the 1st or 2nd Saturday of June at the Miamisburg Civic Center. The cost for the vase is $10 or $12 if paying by PayPal. Alcohol can be purchased from the Moose, but cannot be brought onto premises. No tents are allowed to be set up. No tail-gating in the parking lot. Since the Miamisburg High School Alumni Association is a 501c3 organization as listed with the Federal Government, all donations -- both business and personal -- are tax deductible.